I loved the first book of Jean Johnson’s Theirs Not To Reason Why series. It’s a great blend of military fiction and sci-fi with an awesome strong female protagonist. Plus it’s got a great wide universe with a lot of different species and backstories, which I had been looking for (I wanted something like Mass Effect but in book form and this pretty much is that). I can’t wait to read the second book in this series! After a terrible vision of the future, Ia must somehow ensure the salvation of her home galaxy long after she’s gone. Promoted in the field for courage and leadership under fire, she is now poised to become an officer in the Space Force Navy once she undertakes her Academy training. But at the Academy, she discovers an unexpected challenge: the one man who could disrupt her plans. The man whose future she cannot foresee. Time is running out for Ia, the galaxy is on the brink of the Second Salik War. 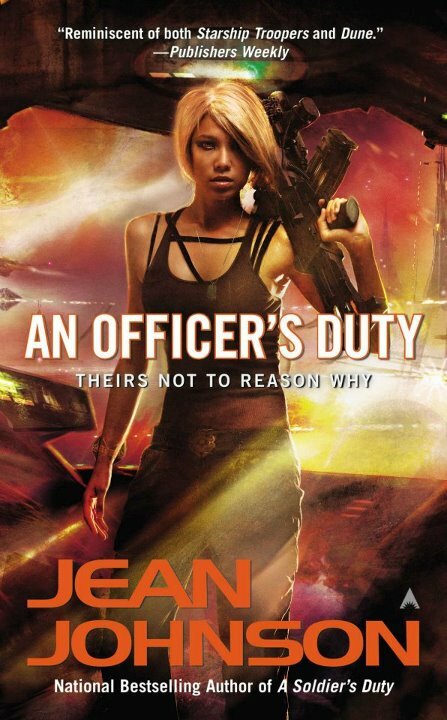 An Officer’s Duty is available on Amazon.co.uk for £4.89 and on Amazon.com for $7.99.